GENEVA – It was 4:40 a.m. Sunday when Iranian Foreign Minister Javid Zarif strode in to meet the world press in the fluorescent-lit Geneva conference center. He’d had little sleep over four-and-a-half days of grueling negotiations, yet he flashed reporters a wide smile and spoke expansively of how terrific the just-completed nuclear arms deal was for Iran. 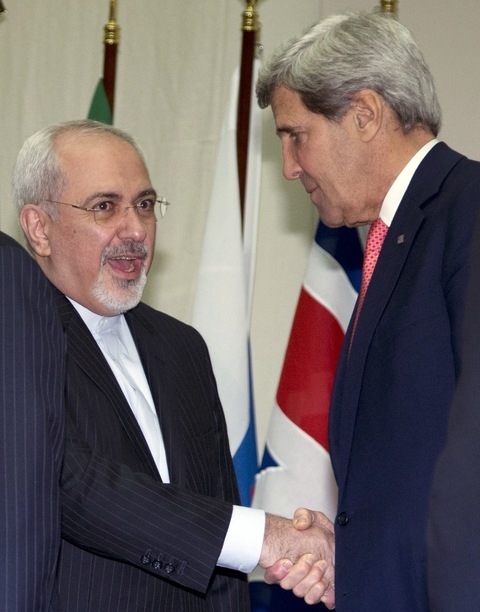 It’s tempting to conclude that Zarif and Kerry were simply spinning the deal for their own domestic audiences and critics, and there was some of that, of course. But the fact is, these two men and their teams had fulfilled the #1 feature of successful diplomacy — especially in a multi-stage negotiation like the one over Iran’s disputed nuclear program. That’s to decide what you most urgently need in the first phase – and what your counterpart most requires as well — and devise a win-win solution that satisfies both. For the U.S. and its allies, and for President Obama himself, the greatest need was to halt Iran’s relentless march to achieving nuclear-weapons capability, which by some estimates is less than three months away. So persuading Iran to agree as it did yesterday to freeze progress in all elements of that program, even roll back one element, for six months, and to accept intrusive international oversight of its facilities, halted the clock just in the nick of time. The need was pressing for the White House. If Kerry’s team couldn’t achieve an agreement in very short order, President Obama faced three unpalatable choices; watch Iran evolve into a nuclear-weapons-capable state, launch U.S. military strikes against Tehran’s facilities or risk the prospect that Israel might do the same, with wildly unpredictable consequences. But it was just as important for the Kerry team to satisfy the two most pressing domestic needs for newly-elected President Hassan Rouhani: to get some relief from the economic sanctions strangling Iran’s economy, and win at least tacit recognition that at the conclusion of the whole process, Iran one day might be treated as a normal civilian nuclear state, not an outcast forever on probation. The modest relief the U.S. allowed yesterday — about $6 billion worth of unfrozen oil sales assets abroad and of revived trade in defined areas like petrochemicals — addressed the first. And on the second, while not caving in to Tehran’s demand for explicit recognition of Iran’s “right to enrich” uranium, the deal includes an acknowledgement that the end result of a broader deal might be an Iran that can run a civilian nuclear program under intrusive inspections, including enrichment, without being punished by the world. Today’s agreement was just the “first step” on what’s going to be a rocky path to finding a comprehensive deal to allay the world’s suspicions about Iran’s nuclear intentions and activities. The tortuous negotiations reflected the deep distrust between the parties. Today’s deal could crumble, and full-scale enrichment and US sanctions revived, if progress toward the big deal stumbles. But Kerry and his team did achieve results by practicing diplomacy the way James A. Baker, Secretary of State for President George H.W. Bush did in negotiating a peaceful transition out of the Cold War against a wounded but still dangerous Soviet Union. The aim is not to humiliate one’s opponent, least of all an economically wounded but still dangerous Iran. It’s to suss out and satisfy your counterpart’s domestic political needs without mortgaging your own leverage in negotiations to come. It’s knowing that skillful diplomacy is really just politics on a global scale — or politics as it used to be practiced in Washington.